Manufacturer of a wide range of products which include anti vibration mounts, anti vibration mounting pad and round mounting pad. At par with client requirements, we offer an exclusive assortment of Anti-Vibration Mountings. Engineered using a finest quality raw material, our mounts are suited for mounting workshop machinery, without being anchored to the ground. Our ready-to-install mounts are highly acclaimed for durability and excellent finish. These are supplied with M16 Tapping D weight of a single unit of 2.5 kgs. With the assistance of our professionals, we have been able to offer a wide range of Anti Vibration Mounted Pad. This product is precisely manufactured by our skilled professionals using supreme grade rubber and modern technology in compliance with international quality standards. 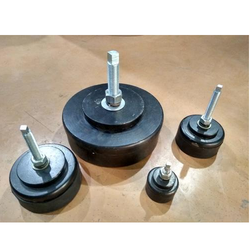 Used in machinery to prevent vibration, our valuable clients can avail this product from us in various specifications at the most affordable price.